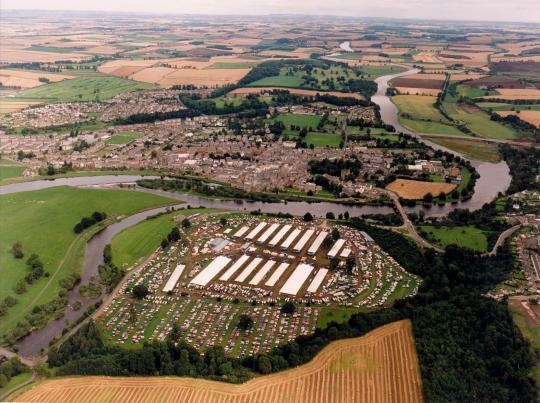 At the recent sale in Kelso we bought two new rams for our Specop and Mattemburgh. We are very happy to add Drinkstone Top Muscle 2010 to our team. He is the third highest index stock ram in the breed with an index of 5.84 and a muscle depth of 6.9. He was by far the highest index ram sold at Kelso. As a lamb he was CT scanned with a impressing eyemuscle as well in depth as width. We were also very lucky to buy a very smart lamb by Strathisla Sinatra from the Sitlow flock of Steve Buckley. He is 45Z:11:057 out of a Didcot Dynamic sired ewe. Tijdens de afgelopen rammenveiling in Kelso heb ik voor Yvette van Koelen een ramlam van Sitlow (45Z:N52) aangekocht. De vader is Cairness Carbon. Het is de tweelingbroer van de ram die een tweede plaats haalde in de groep op de Edinburgh show 2010 en uit een dochter van 45Z:C53 die eerder Sitlow Sensation ter wereld bracht. Deze ooi is ook de grootmoeder van de ram die dit jaar voor Sitlow de eerste prijs in Edinburgh haalde en daar voor 4000 gns werd verkocht. Er komen nog meer goede rammen naar Nederland. Voor de familie Hoekstra werd een best ramlam van Solwaybank aangekocht. De handel in Kelso was best, zeker voor de ‘performance flocks’. Essie (Irene Fowlie), Sandyknowe (Malcom Stewart) en Rugley (Jackson) maakten gemakkelijk prijzen van gemiddeld 700 pond en meer. Traditionele fokkers leken het wat minder te doen en grote uitschieters in prijzen bleven uit. Verder is de zo’n dag in Kelso een geweldig evenement en heb ik daarweer de nodige contacten opgedaan. Het was kortom een geslaagde trip! By Jonathan Long and Suffolk Sheep Society. The 2010 Edinburgh sale had a 69% clearance rate. This year’s sale grossed £235,384 and averaged £1,929.38 for 122 ram lambs sold. 20,000gns was the top price paid to S Buckley’s, Sitlow flock, for a Cairness Carbon son who had stood reserve the previous day. R Wilson, Strathisla, who judged this year’s sale was the final bidder with a third going to CA Proctor’s Conveth flock. Sitlow had the highest average of the day of £6,720 for four lambs sold. The second highest price of 18,000gns was paid by the Robinson family from N Ireland for a Strathisla Sea Bird son. This was the first lamb in a pen of nine from R Wilson. The Strathisla flock went on to average £4,635. S&W Tait had the third highest average on the day of £3,754 for five lambs sold. The Burnview flock had a top call of 6,000gns selling to Mrs RH Goldie’s Harpercroft flock. 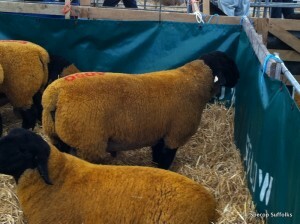 JG Douglas had won the overall Champion by a lamb from the 1st place group of three. This lamb by Baileys Bacchus was sold for 5,000gn. However, it was the Cairness lamb by Fyvie Classic that had been placed third in the single ram class that obtained their highest price of 10,000gns. Overall J Douglas ended the day to average £3,022 for nine lambs sold. The Rhaeadr flock of M Evans from Wales received the third highest price of 12,000gns from the Barbour family from Annan. This ram lamb is a son of Baileys BMW who has won the Royal Highland and Royal Welsh shows in 2010. This was the icing on the cake for Myfyr who had a complete clearance of his eight lambs to average £3,137. The fifth highest price of 9,000gns was paid to CA Proctor and Co. The Conveth flock ended the day with an average of £2,373 for five lambs sold. Mark Priestley, Limestone flock, received 7,000gns for a Strathisla Stoner son selling to B Nicholson. The Middlemuir flock of Pat Machray received a top call of 5,00gns for a Cairness Stockbroker son. Pat had one of his best days to go home with an average of £2,153 for his three lambs sold. Last week’s sale of Suffolk ram lambs at Edinburgh failed to produce the sparky trade of previous years, with the average falling by more than £200 on the year and 30 fewer lambs finding new homes. Traditionally the dearest sale for the breed, this year it only managed a top price of 20,000gns, some 6000gns short of the best achieved at the previous week’s National sale at Shrewsbury, with a number of the best prices paid by flockmasters dispersing their flocks later this year. Taking the top call was the reserve champion from the pre-sale show, a Cairn ess Carbon son out of a dam by Strathisla Sinatra, which was also dam of last year’s champion from Shrewsbury. Bred by Steven and Louise Buckley, Derbyshire, this one was bought in a two way split by the event’s judge Robbie Wilson and Charles and Kevin Proctor. Next best was an 18,000gns bid for the best from Mr Wilson’s own Strathisla flock. This was a son of last year’s Edinburgh champion Strathisla Sea Bird and is out of a dam by Glenho Gurka, which is herself full sister to 48,000gns sire Strathisla Dylan Thomas. Buying this one were Northern Irish breeders Alfred and Norman Robinson, Co Down. And then at 12,000gns was the best of the day from Myfyr Evans Rhaeadr flock, Denbigh. Taking this price was a son of this year’s Reserve interbreed from the Royal Highland, Baileys BMW. Out of a ewe by Cairness First Flight, he was knocked down to Iain Barbour for his Solwaybank flock, Annan. Then, making 10,000gns was Jimmy Douglas with a lamb from his Cairness offering. This one, a Fyvie Classic son is out of a dam by Cragoe Craftsman. The only lamb by Classic this year, he sold to a brace of buyers, H P Sleigh and Sons for their Wells flock which will be dispersed later this year and Gordon Troup for his Whitestone flock. Selling at 9000gns was a Cairness Achievement son from the Proctor family’s Conveth flock. This triplet lamb is out of a dam by Castlewellan Nutcracker and sold with an index of 2.23. Taking this one home were a duo of Northumbrian buyers, Hugh Annett and Sons, Morpeth and Colin Campbell and Sons, Alnwick. Following that sale at 7000gns was the top sale for Northern Irish consignor Mark Priestley of the Limestone flock. His best was a Strathisla Stoner sired lamb ET bred out of a dam by Castlewellan Tonto which has bred lambs to 7500gns previously. This one sold to Shetland-based Bryden Nicholson for his Innfield flock, another flock due to be dispersed later in the year. Two then sold at the next best price of 6000gns with the first being a Baileys Headstart son out of a dam by Burnview Beamer from Willie Tait. Selling with an index of 3.28, he was first prize ram lamb at Balmoral show and sold to Helen Goldie, Dundonald. The second at this money was a son of Strathisla Sea Bird from Barclay and Lucy Mair, Turriff. He is out of a dam by Meikleson Impression and was bought by Chris Holmes for the Rookery flock. Champion was a Baileys Bacchus sired lamb from Jimmy Douglas out of a dam by Cairness Renovator which is in turn out of a Glenisla ewe bred in the late Gordon Wilson’s flock. Average; 122 ram lambs £1929.38 (Lawrie and Symington). Bij mijn bezoek in mei aan Steven en Louise Buckley maakte ik nog een paar beelden van hun lammeren. Wat mij zelf het meest opvalt is toch hoe die dieren nog gegroeid zijn als je ze vergelijkt met de beelden van dezelfde rammen op de veilingen in juli. A packed ringside resulting in a cracking trade for our first main Suffolk sale of 2010. Of the 236 lots entered, forty one animals made four figure sums with two further lots making over 10,000gns. Top price of 26,000gns was paid for the Champion ram lamb presented by J Douglas. After some furious bidding this Cairness Achievement son was knocked down to Gary Beacom for use in the Lakeview flock, N Ireland. The second highest price of 13,500gns was paid to G Biddulph. The Pexhill flock ended the day with an average of 3,914gns for five sold. TA Irwin and Sons from Devon had the third highest price when A Wilson and J Gibb paid 8,200gns to secure a Cairness Carbon son. The Kings flock sold four lambs to average 2,770gns. WH Sinnet’s Stockton flock was one of the largest vendors with twelve tremendous lambs. Their consistency was matched with some furious bidding. With a top call of 8,000gns for the reserve champion John went on to average 2,112gns. RH Wilson also secured a 8,000gn bid for a Glenhead Golden Phoenix son. The Strathisla flock had a complete clearance of their nine lambs to average 2,244gns. Performance recorded stock were also in demand by both pedigree and commercial customers. The Bentley flock secured a top price of 5,200gns from M Prince and R Garner for an animal at the top of the breed percentiles. The Harding family sold six to average 1,970gns. The best from G Owen’s Morris flock was 4,800gns for a Plasllewelyn Pirate son. Five lambs on offer were sold to average 1,626gns. S&L Buckley’s sold a Roundacre Raceway lamb for 4,000gns. The Sitlow flock ended the day with five sold to average 1,232gns. M Evans Rhaeadr flock secured a top call of 3,600gns for a Baileys Brigadier the Second son. Myfyr’s eight lambs sold to average 1,226gns. The Midhope flock of John Key also had a cracking trade for Signet performance recorded stock. With prices at 3,000gn and 2,600 John ended the day with an average of 1,232gns for five sold. A few more updates have come my way from Shrewsbury today including the sale of the reserve champion, a single ram lamb (lot 126) from John Sinnett, Worcs. By Stockton Thriller the Second, this one is out of a ewe by Gaval George and goes back to Crosemanor Jubilee King and sold for 8000gns and sold to a consortium of breeders led by Tom Cox, Staffs. Next at the same money was one of the best from Robbie Wilson, Turriff. By Glenhead Golden Pheonix, who was purchased for 12,000gns last year, this embryo-bred lamb is out of a ewe by Glenho Gurkha and sold to G Christie, Inverurie. Another from Robbie, this time, a lamb by Strathisla Speedson out of a ewe by Bawnogue Blazing, sold for 5500gns. This one is full brother to Strathisla Obama, sold for 10,000gns. Prior to that sale Robin Irwin, Devon, sold a single from their Kings flock for 8200gns. This one is by Cairness Carbon and is out of a ewe by Davishill The Crown and sold to Angus O Wilson for his Glenhead flock. Early reports from the Suffolk sale at Shrewsbury are that trade is currently topping at 13,5000gns for a ram lamb (lot 50) from Geoff Biddulph’s Pexhill flock, Cheshire. This twin lamb is by Cairness Achievement who was champion lamb at the national sale in 2009 and sold for 20,000gns. Buyer here was Jimmy Douglas. The dam is by Stockton Sky’s the Limit who sold at the 2005 Pexhill sale to Cairness for 2000gns and was later re-purchased last year. The only other news I have is from early on in the ram lamb running when Steve Buckley, Derbyshire, sold a single by Roundacre Raceway out of a Perrinpit High Peak-sired ewe. This one went at 4000gns to Lilburn Estates, Wooler, Northumberland. Later on in proceedings, a twin lamb from Tom and Charles Harding’s Bentley flock has sold for 5200gns. This one is by Drinkstone Elite Supersire and is out of a dam by Drinkstone Supersire and was knocked down to M Prince, Derbyshire and Messrs Garner and Son, Lincolnshire.